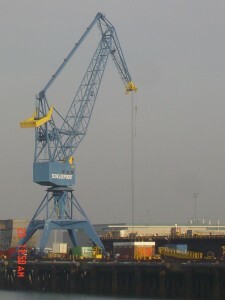 This is a functional model of a real 40 tons shipyard crane, working in the port of Vlissingen, The Netherlands. The height of the model, when at minimum outreach, is approximately 1,9 m and it is built according to the general arrangement plans of the real crane, some photo’s and my own observation, as I’m working on the same ship repair yard. The scale is more or less 1 : 30. The model is functional for as far as the slewing and topping movement. The travelling, however motor driven is not very good. Hoisting with both winches works, but due to lack of ballast weight, the lifting capacity is very limited. The force in each of the crane’s 4 legs is evenly distributed to 3 travelling wheels, which on the real crane, travel on rails with 15 m gauge. On each side of the crane an old 9V motor drives, via reductions, the travelling wheels. May be, if I had fitted the rubber tires on the wheels the crane would have moved over the floor covering. The bogies are connected to legs with threaded axles and nuts. The construction, having 3 wheels on each corner of the crane requires a bogie lay out with 2 wheels in 1 bogie and 1 wheel in the other. Even force distribution is achieved by applying the force from the leg on the forward bogie, but directly above the middle wheel, which is in the aft bogie. Slewing gave me headache. I made a slewing table out of bricks on it’s sides which gave me a surface for wheels to travel on. In the middle of this table is a hole, in which a Technic turntable is anchored. The upper part of the turntable is connected with bricks through the center to the column of 2×4 bricks which is visible in the lower part of this photo. This column is supposed to bring the weight down to a thrustbearing in the center of the crane, where the horizontal cross members meet. The slewing table is supported on the outer diameter by 8 rods which go up from each corner. The connection between these rods is shown here in it’s full misery. The slewing gear is driven by a medium 9v power functions motor and was fun to built. The topping, or luffing movement is what I like most of this type of crane. In this case the jib is moved in and out by a crank-rod mechanism. When the jib moves out it pulls up a counterweight and so balances the movement of the jib. The cranks are powered by a large power functions motor through a reduction, of course. When the jib (also called the push arm) moves outward, the pull rod, which is connected to the tower, pulls the aft of the top jib (the part with the yellow tip) down. This, together with the outward motion results in a horizontally level movement of the tip of the top jib, and, consequently, in a horizontal movement of the crane’s two hooks. This photo shows the main hoist (grey), driven by a large PF motor and the auxiliary hoist (yellow) driven by a small PF motor. For the hoisting wires I used kite wire. The four motors are remote controlled with infra red. The battery pack is also hanging from the engineroom ceiling, as far as possible aft, to help provide counterweight. Altough I hid some old small steel ball bearings in the floor of the engine room this was by far not enough counterweight. It was sufficient to compensate for the jib moving out, but the crane was not capable of any significant load. In my next model I will have to add a lot of lead.